I wasn't really feeling the gym today but was already dressed for the part so I walked over to the YMCA for the 3rd time this week. I cycled on the bike for 20 minutes at a difficulty level of 3 on the hill setting for 7 miles. Then I headed over to the free weights and did the following bicep exercises using a pair of 5 pound weights. -hammerhead curls, 3 sets of 12 reps.
what is up with me delaying my weekly pregnancy posts by 1 day? better late than never! this past week has been so much more enjoyable. 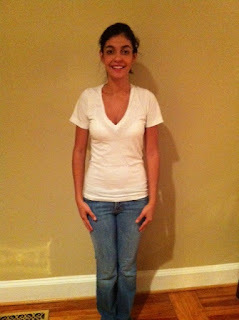 I think I am really going to enjoy my 2nd trimester. I've found myself having more energy and feeling a lot better. I've been incorporating more vegetables into my diet and have stopped relying so much on cereal, bagels, and other carbs to satisfy my hunger. The highlight of this past week was my major increase in running. I ran on Monday, Tuesday, Thursday, and did a long run on Saturday. Total mileage was about 20 miles for running and about 4 or 5 miles in walking. This puts me right on track for half marathon training. 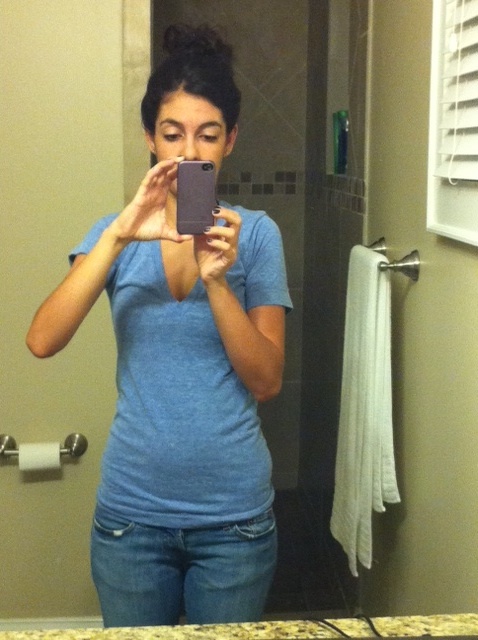 I'm wearing another American Apparel shirt (so comfortable) in size x-small (Track Shirt) and size 0 (25) Lucky Brand Jeans. 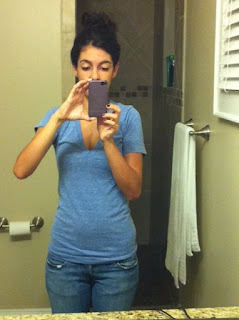 Still thankful my clothes are fitting and that I haven't had to jump into any larger sizes (yet). 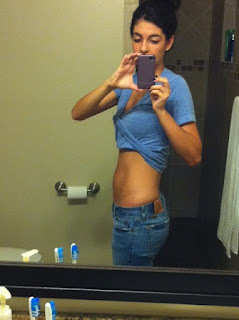 This week I haven't gained any additional weight so I'm still at about 5-6 pounds total for the entire 13 weeks. This morning I woke up a little later than I was hoping (8:30) but that didn't stop me from heading straight to the YMCA. I got there by 9am and jumped on a treadmill. Total - 8.23 miles in 1 hr 20 minutes. Once I got home I made some breakfast for my hungry husband and I.
Eggs, bacon, and French toast. Now to do some shopping for the house! This morning I treated myself to breakfast (like every other Friday) and headed to Einstein's. I used a coupon for $2.99 for a bagel thin with schmear and medium coffee. I went with the bad breath special ... Everything bagel thin with reduced fat garlic cream cheese. And for those of you wondering about my medium coffee while pregnant, have no fear, I didn't fill it up all the way. I knew I wouldn't want to run today after work so I wore gym clothes to work to go during my lunch break. There is a YMCA a few blocks away from our office building so it wasn't too far out of the way. Around 10:30am I had a snack to make sure I had enough energy for my run. It was my first time using almond butter from Trader Joe's (I got the salted creamy flavor). I added some boysenberry preserves to the other piece of whole wheat toast and had quite the delicious little snack. 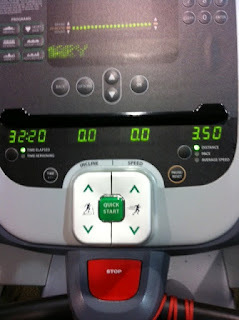 At the gym I walked for one minute as a warmup then ran for 29 minutes. I finished up my run with one minute walking cool down (total miles 3.32 in 31 minutes). The walk to and from the gym is about 0.35 miles, so add 0.70 miles to my run and I had a 4 mile day! Oh and what are your thoughts on sitting back at work in my sweaty gym clothes? Charlotte runners. I was very lucky to have Elisa stick by me and keep me at a comfortable pace (I didn't want to overdo it). After already running 5 miles, Elisa did a great job of motivating me through her 2nd 5 miles of the day. I fumbled with shutting off the Nike app after the run so the time is a little off, but I'll take a sub 10 minute/mile for a 5 mile run at this stage. Feeling better after 2 runs this week. I'm taking today off from running and will be back at it tomorrow with another 3 miler. Yesterday I decided to bring back cardio exercise! Now that we've moved away from uptown Charlotte, I don't have the luxury of walking home for lunch. Instead I found myself with nothing to do yesterday at noon. I decided to head out for a walk and did 2.06 miles in 26:46 minutes around downtown. It was good to get some fresh air and escape corporate life for a little bit. Once I got home from work I changed into some running clothes and headed out for my first run around my new neighborhood. One of the downfalls of the run were all of the traffic lights that I had to stop for ... at one point it was over 1 minute of waiting at the corner. 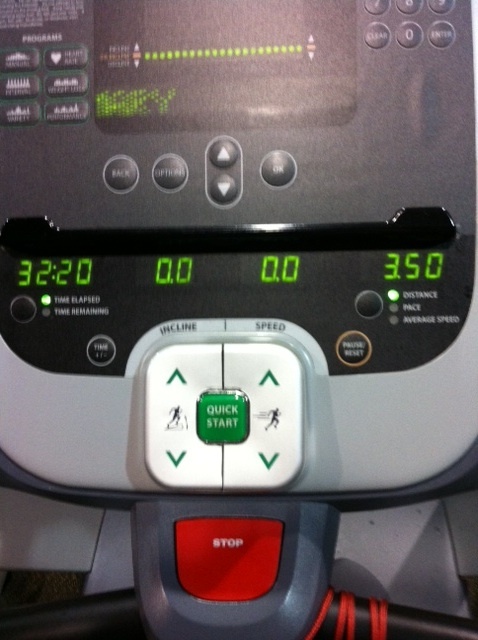 I managed to run 3.26 miles in 29:45 minutes. Sad that it's only 1/4 of what I'll be running at the half marathon in less than 7 weeks. 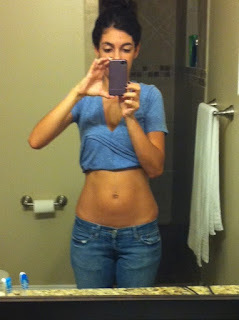 I'm trying to stay positive though, and keep hoping that with some training the next few weeks I'll be ready on 11/5. 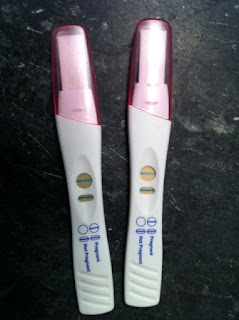 I'm so excited to be finally writing this post ... Ryan and I are having a baby! We took our pregnancy test (correction tests) on August 5th and found out that I was indeed pregnant. Since then I've gone to 3 doctor's appointments, had 2 ultrasounds, and have had lots of blood drawn. I've gotten my due date changed from March 25th to April 1st and have dealt with all of the ups (but mostly downs) of the first trimester. Thankfully I've been feeling a lot better the past couple of days and am looking forward to getting some of my energy back. So far I'm still wearing all of my same clothes. I've gained about 5 pounds but I think most of that is from not running. The doctor cleared me to run as much as I was running previously, but between traveling out of state for a wedding, moving into our new house, and generally feeling nauseous and tired all the time, I haven't logged as many miles. Last time I ran was 9/7 (eek!). I know a lot of girls have posted weekly pictures of their baby growth, but I wanted to give credit to the 2 blogs that I read the most: Daily Garnish and (Never Home)maker, baby! Emily and Ashley have provided so many tips and advice during their first pregnancies, that I hope I can do the same. I'm still planning on running the Rock n Roll half marathon in Savannah on November 5th. I'll probably do a combination of running and walking but am hopeful that I'll be able to complete the race with no issues. With less than 7 weeks to go I have a lot of training to do. Thankfully the weather has cooled down in Charlotte so I'm looking forward to less treadmill running and more outdoor running. This morning Ryan and I continued our Friday tradition of hitting up Dunkin Donuts for breakfast. I ended up with my usual, egg and cheese croissant, but switched up my coffee ... No iced coffee this morning! Instead I chose a French vanilla flavored coffee in the HOT variety. It's pretty chilly in Charlotte this morning (59 degrees) so I wanted something to warm me up. On the side I bought 2 different munchkins ... Did you know you can order as many or as little as you want for $0.25 each? On the left is blueberry cake and on the right is their new pumpkin flavor. Hands down I might have a new favorite munchkin ... The pumpkin one was delicious. Yesterday while at the doctors office I got my flu shot for the season. From what I remember, the past couple of times I've gotten this shot I've effectively kept the flu away. Fingers crossed the same thing happens this time around. Worst part of the whole process is the arm soreness afterwards. My upper arm is still killing me from where I got the shot. This morning my body was screaming for something nutritious. I guess the past few days have been filled with sub par eating options ... Totally happens when I go out of town, especially for a wedding. I busted out the blender and made myself a delicious and healthy smoothie. I put in the blender some spinach, frozen banana pieces, a scoop of peanut butter, and some vanilla soymilk. My body says thank you! I planned on running at the gym this morning (like usual) but quickly changed my mind when I saw it was 58 degrees outside! My destination was Chikfila to pick up my free chicken biscuit. Now to enjoy the rest of my morning before I have to work 2-10pm today. Gross! This morning I toasted up one of Lender's 100 calorie bagel thins (in whole wheat for breakfast). I topped each slice with some butter and apple butter spread (love the butter). I love that companies are embracing a healthier version of delicious (but ordinarily high calorie) food. Hopefully it'll keep me full until my mid day snack of organic strawberries. Ryan and I continued our weekly Friday tradition of going to Dunkin Donuts before work this morning. I stuck with my usual, egg and cheese on a crossiant and small iced coffee. Lately I've been ordering 2, yes 2, blueberry munchkins. Those things are the jam ... The blueberry jam? Haha. I wanted to apologize for being so disappointing lately on this blog. I don't run as much anymore, which is worrisome since our half marathon is in 2 months. Doctors orders ... Take it easy for a few weeks and only run 2-3 miles a few times a week. Grr! I'm looking forward to running more in a couple of weeks. I miss it and have totally been in a rut about it. 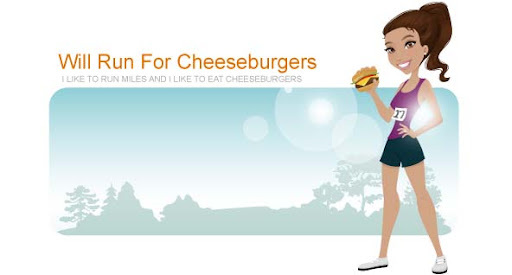 Oh and another disappointment of the blog ... Where are all of the cheeseburgers? I promise to get out there and eat more cheeseburgers for those couple of people who read the reviews on here. Promise. Happy Friday everyone ... Hope the 3 day weekend treats everyone well.